As I said on the home page, I had a conference in Monterey, CA (IEEE Pulsed Power Conference) and Jill and Rachel came along so we made a vacation of it. 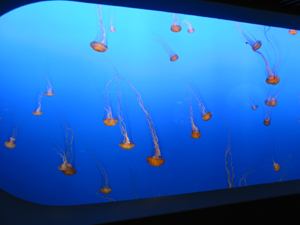 We arrived a day early and started vacation by going to the aquarium, one of the best in the world. The conference ended about 5pm each day so we had plenty of time to have fun. 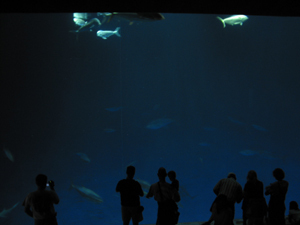 The conference rented the aquarium one evening and set up tables for dinner. 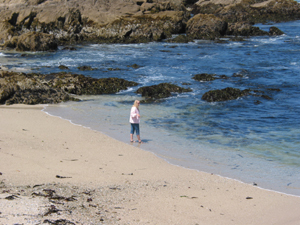 We also took a drive around Pebble Beach, see the scenery page. It was a great week! Oh, and the conference went well too. 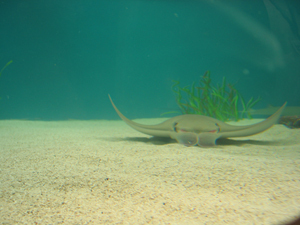 In this tank you could watch the sting-rays swim right toward you. 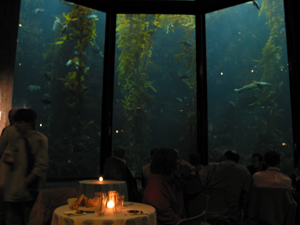 At the conference night at the aquarium people at dinner by the fish tanks, including this tank of giant kelp and various fish. 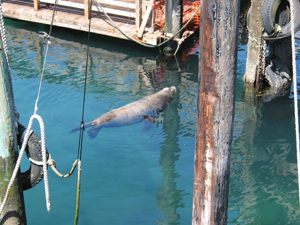 We also saw many sea lions living in the wild. It was a little cold for swimming in the bay, but Jill wanted to touch the water anyway. 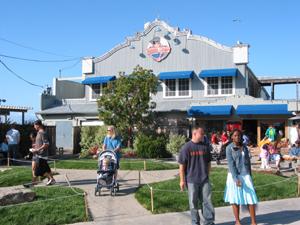 We ate at several restaurants including this Bubba Gump Shrimp Co. This is the only picture we have as proof that I actually attended the conference. 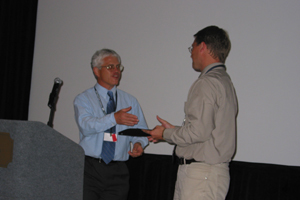 I received the 2004 pulsed power student award.